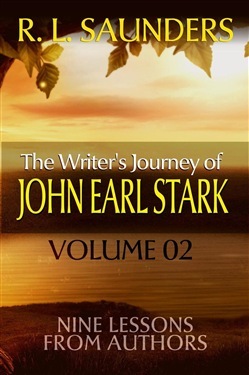 John Earl Stark problems were far from over. He was up to his neck and now his stories were running his life. All he wanted was to improve his book sales. But what he got was too many stories to write. And now he wasn't sleeping as a result. There were just too many and they wouldn't stop coming. He simply couldn't write them fast enough. Worse, the stories were getting jumbled, the characters mixed. If he didn't do something soon, he'd probably go insane. Focus. It's a matter of focus. And staying awake. Excerpt: It's been a week of too much and too little. All delivered through dreams, or just after waking. John got way too many. He'd find himself awake with a story sitting there, but it would be 2 or 3 am. So he'd turn over, and then at 4am he'd be woken with another. You know the one's he writes - mysterious supernatural situations only a human can save them from. So he was right in to these opening scenes, like a moving running along through his mind. Dumped right in the middle of the action and all the charactes shouting out their lines in "3D Cinerama-scope". But the other stories that woke him up that early morning seemed gone. If he just lay there and close his eyes, they'd be back, though - either starting over or picking up where they left off. Rolling over tended to help. By the time it was light enough to see, he was still exhausted and now had all the chores of the farm to take care of. Dogs and cats to feed, a milkcow to relieve, cattle to check. Those things aren't just put off. Real live creatures needing his care. So he'd be up and at them, somehow keeping his eyes open enough to not burn himself during breakfast. Slogging through the weather and the routines. Then he'd come back and shrug out of his outdoor clothes and collapse on his couch for "just a few minutes" - only to find himself with yet another story waking him and demanding to be written into existence. After a few days of this, he finally would get a pad and paper by his bed, and turn on the light to write down the opening scene and any details - something he could use later to hopefully pick up that story again. Didn't work out. He did have 6 or 8 new opening scenes he could mine. But where they went from there was still another problem. At last, he did just force himself to sit down and write one of them all the way out. But it was a mystery from the start. He only had a scrap of a line to write from. But write he did - and it turned out OK. 6K words where this team of his spooks go and take on the entire government to get them to stop hunting people with "extraordinary abilities" just so they could do their genetic research and experiments. Happy ending, an all that. For me, it was worse. I took his idea of getting that pad and paper, but I only wound up with lists of phrases. And spent most of the night tossing and turning to get back to sleep again. Then daylight would make sleep impossible - and I'd trudge over to John's cabin for some of his to-die-for coffee with honey. I don't share his love of watching cattle graze, so pretty much I'd sit out on the front porch with his farm dog and pet her if she wanted it. Otherwise, just relax. Maybe with one of those books. Sometimes dozing off again. When John came back, we'd hit the books again. So here's where we picked it up: Scroll Up and Get Your Copy Now. Acquista The Writer's Journey of John Earl Stark 02 in Epub: dopo aver letto l’ebook The Writer's Journey of John Earl Stark 02 di R. L. Saunders ti invitiamo a lasciarci una Recensione qui sotto: sarà utile agli utenti che non abbiano ancora letto questo libro e che vogliano avere delle opinioni altrui. L’opinione su di un libro è molto soggettiva e per questo leggere eventuali recensioni negative non ci dovrà frenare dall’acquisto, anzi dovrà spingerci ad acquistare il libro in fretta per poter dire la nostra ed eventualmente smentire quanto commentato da altri, contribuendo ad arricchire più possibile i commenti e dare sempre più spunti di confronto al pubblico online.